Before analyzing the ITCZ width, we first need to define it. The ITCZ is located at the ascending branch of the Hadley cell, an atmospheric circulation associated with rising air near the equator and descending air in subtropical regions (see Fig. 2 for a schematic). This suggests a simple definition of the ITCZ width – as the portion of the Hadley cell where there is rising air (Fig. 2). Using reanalysis data, the ITCZ width averaged over all longitudes is estimated to be 27° of latitude, though it varies considerably in longitude (Fig. 1). This compares to a width of 66° of latitude for the tropics as a whole (Seidel et al. 2008). Not surprisingly, given that rainfall is associated with rising air, the edge of the ITCZ bounds the regions of heaviest rainfall in the tropics (compare the colours and the red line in Fig. 1). So what sets the ITCZ width? Figure 2. 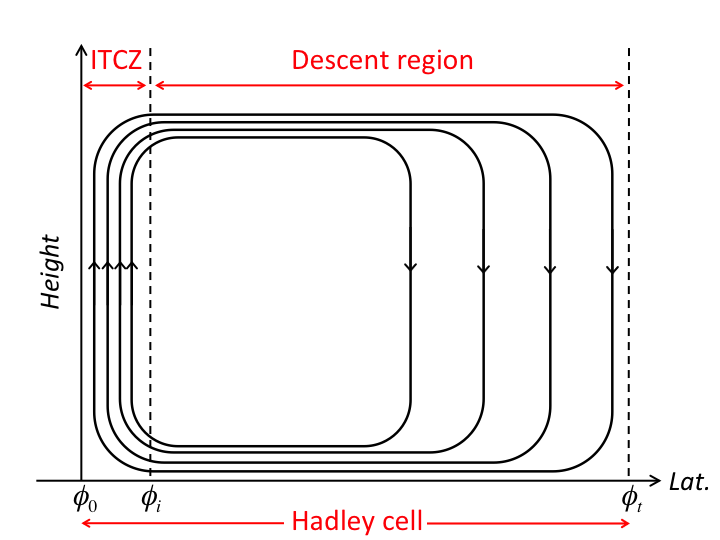 Schematic diagram of the Hadley cell as a function of latitude and height, showing the boundaries of the ITCZ and the descent region. The ratio of the ITCZ area to that of the descent region is equal to minus the reciprocal of the ratio of the vertical velocities. As mentioned, the vertical velocity in the ITCZ is stronger than that in the descent region, implying that the area of the ITCZ is smaller than the area of the descent region. What determines the strengths of these vertical velocities, and consequently the ITCZ width? To answer this question, we turn to the energy budget of the Hadley cell. As discussed in the previous blogpost, the net energy input to the tropical atmosphere (i.e., shortwave plus longwave radiative heating minus ocean heat uptake) is positive. Therefore, to establish a steady state, atmospheric circulations are required to move energy from the tropics to higher latitudes. In the ITCZ, the bulk of this energy transport is performed by the Hadley cell. The energy export out of the ITCZ by the Hadley cell is the product of the strength of the vertical velocity, , and the “gross moist stability”, denoted as . Heuristically, the gross moist stability is the difference in energy content between the air flowing out of the ITCZ in the upper branch of the Hadley cell and the air flowing into the ITCZ near the surface; it is also a measure of the efficiency of the Hadley cell in moving energy. Thus, if we know the net energy input to the atmosphere and the gross moist stability, we know (approximately) the vertical velocity in the ITCZ. From the mass budget equation, the ITCZ width also depends on the vertical velocity in the descent region – what processes determine that? where is the gravitational acceleration, is the net radiative energy input to the atmosphere, is the ocean heat uptake, is the north-south wind, and is the energy of an air parcel (specifically the moist static energy). The overlines indicate time averages, the dashes denote departures from time averages, the curly brackets indicate a vertical integral over the entire atmosphere, and the angled brackets represent a spatial average over either the ITCZ or the descent region. where the subscripts and denote averages over the ITCZ and the descent region, respectively. The width of the ITCZ (relative to the descent region) is proportional to ratio of the gross moist stabilities in the two regions. Thus, we would expect a narrow ITCZ because the gross moist stability is larger in the descent region (Hill et al. 2015), assuming all other terms in the energy budgets of the ITCZ and descent region are equal. The ITCZ is indeed narrow compared to the descent region, in part due to differences in gross moist stability. However, other processes also influence the ITCZ width, including differences in the net energy input to each region (which are strongly modulated by the presence and behaviour of clouds) and transient eddies. The expression for identifies the processes that control the ITCZ width, and so it is potentially useful for analysing biases in ITCZ width in comprehensive climate models. Figure 3. 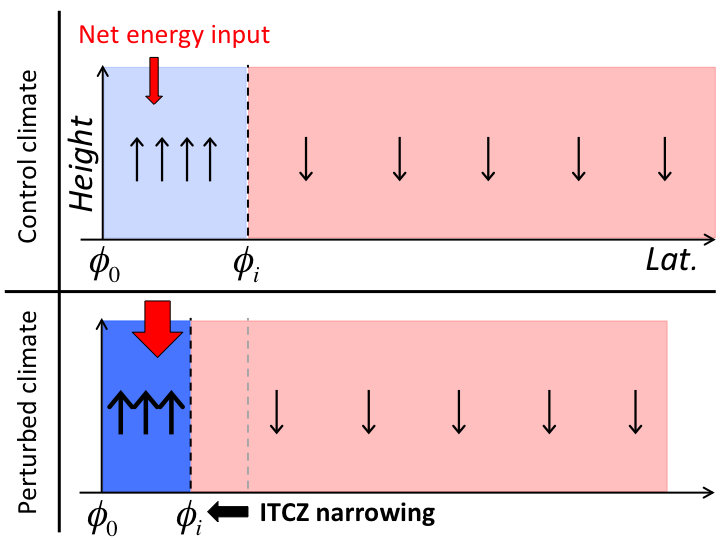 Schematic diagram of the Hadley cell showing the mechanism by which increases in net energy input to the ITCZ lead to a narrowing of the ITCZ (relative to the descent region). Linearising the expression for , we derive an equation for the response of the ITCZ width to changes in climate in terms of changes in gross moist stability, changes in net energy input to the atmosphere, etc. To explore how these physical processes influence the ITCZ width, we use an idealised climate model (see O’Gorman & Schneider 2008 for a description) to simulate a wide range of different climates. The ITCZ in this model shows rich behaviour as the climate is changed, widening with warming in cold climates, narrowing in temperate climates, and maintaining approximately a constant width in hot climates. Different processes affect the ITCZ width in different ways. For example, increases in net energy input to the tropical atmosphere tend to narrow the ITCZ whereas increases in energy transport by transient eddies tend to widen the ITCZ. How can we understand these narrowing and widening tendencies physically? An increase in net energy input to the ITCZ in a perturbed climate (via reduced outgoing longwave radiation due to increased carbon dioxide concentrations, for example) means that, for energetic balance, the circulation and vertical velocity in the ITCZ must strengthen in order to export the excess energy (assuming the gross moist stability in the ITCZ is positive and constant). From the mass budget of the Hadley cell, an increase in vertical velocity in the ITCZ implies a narrowing of that region relative to the descent region (see Fig. 3 for a schematic diagram illustrating this narrowing mechanism). Analogous arguments can be made to understand the influences of transient eddies, gross moist stability and mean advection on changes in the ITCZ width. We have outlined how the ITCZ width depends on a variety of physical processes, some of which are neither well understood nor well simulated by climate models (e.g., clouds). Nevertheless, the theory and analysis presented here provide a framework with which to investigate how and why the ITCZ width has changed in the past, and whether it will narrow or widen in the future – the latter question is the focus of ongoing research.